New. Trade paperback (US). Glued binding. 284 p. Contains: Illustrations, black & white. New. Sewn binding. Cloth over boards. 284 p. Contains: Illustrations, black & white. New. 100% Money Back Guarantee. Brand New, Perfect Condition. We offer expedited shipping to all US locations. Over 3, 000, 000 happy customers. Sewn binding. Cloth over boards. 284 p. Contains: Illustrations, black & white. Being an abridged book it is still a joy to read. For someone on an intellectual journey read the abridged version first before seeking out an unabridged or slightly abridged. This version is very witty, and easier to read. 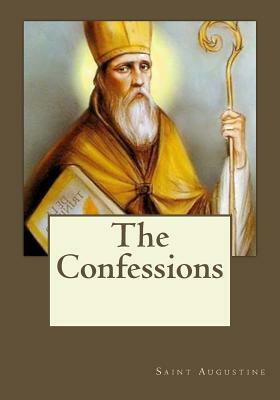 Semi-autobiographical in nature (and interspersed with prayer and Scripture), The Confessions of Saint Augustine reveal, among other things, the spiritual journey of one of the most important theologians in Christianity. The subject of this review is the translation found in Volume 18 of the Britannica Great Books series. The pursuit of truth and the struggle between the flesh and the spirit are two prevalent themes. Augustine also considers philosophical issues related to the nature of time and the origin of evil. He thoroughly expounds Genesis 1:1 as well. The book is full of relevant scriptural lessons and thoughtful insights on spiritual living. The following is a list of quotations and paraphrases from Augustine that I found to be helpful and inspirational: Avoid anger; God is still close to us even though we are far from Him; A happy life is joy in the truth; Christ is both Victim and Victor; Press on where truth begins to dawn; No man's sin doth either hurt Thee or disturb the order of Thy government; Woe is me without Thee; For we submit our understanding unto the Bible, and hold for certain that even what is closed to our sight is yet rightly and truly spoken. This translation was, at times, a bit challenging to read. Still, a patient reader will be rewarded with insightful lessons from this candid and self-effacing prayer written by one who struggled with sin in his life. In this great classic, one might think of the words - "behind every great man there is a woman". In this case, it was Augustine's great mother, now known as St. Monica who was the woman who prayed for his conversion for twenty years or more. Augustine, in a great tone of deep humility, addresses God mostly in this wonderful classic. It is as if we are given a keyhole into the daily conversation between God and this great, yet humble saint. The richness of Augugstine's thought and theology are touched on, merely a precience of what grew into his great corpus of work. In Rome, one can still see the tomb of St. Monica in the church of St. Augustine in North Rome. reading this book may make you a better person! I have not finished this book as yet, it is not a book that you rush through. I'm finding that I am totally facinated with St. Augustine and the way he perceived the world he lived in; his conversion was nothing short of a miracle of prayer. His mother, St. Monica prayed for him for 20 years before he was converted to Christianity. St. Augustine was one of the most prolific Latin authors, and the list of his works consists of more than a hundred separate titles. Confessions is much easier to read than I thought it would be. The translator has made the book read like a modern day book, opting to leave out the traditional thee's and thou's making it easy to understand and read.